Drop earrings and dangle earrings are similar to each other and the terms are often used interchangeably. However, the two styles do have a notable difference. Drop earrings most often refer to a decorative stud (or post) earring that has an additional single element that hangs from the decorative stud and extends below the earlobe to create a flattering and elegant vertical line or teardrop shape. The hanging element is typically slender or teardrop shaped, to create a delicate and graceful vertical line that is almost fluid in appearance. The hanging element may be any length (though typically remains a conservative length) and can either be fixed to the decorative post so that it remains stationary with movement, or attached to an open loop at the bottom of the decorative stud so it can swing freely with movement. Dangle earrings are a somewhat catch-all phrase that refers to virtually any style of earring that hangs from the lobe via earwire or post in which the majority of the decorative element hangs below the lobe. Dangle earrings can be made rigid with no loose or disjointed parts for limited movement or designed so that one or more elements swing independently of the ear wire to maximize movement with motion. 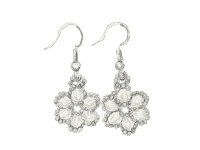 Dangle earrings come in virtually every shape and size and are one of the most popular styles of earrings. Several styles of dangle earrings are so popular that they have their own sub-set style names (but they are all still technically "dangle" earrings). These subsets of dangle earrings include; fringe earrings, tassel earrings, chandelier earrings, shoulder duster earrings and threader earrings (these subset styles are listed on their own category pages for ease of shopping).